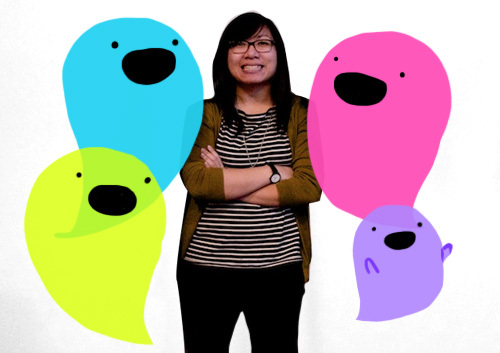 Meet Kim Ku, a freelance designer and illustrator based in New York City. She is a graduate from the University of Pennsylvania with a Fine Arts degree concentrating in mixed media animation and design. During the day, she designs websites for books and authors, and has created work for various clients including Penguin Books, Random House, Harvest, Tapestry, Tonx, and others. In her free time, however, she uses her talent in mixed media and design to create wonderfully whimsical illustrations, books, and prints, and continues exploring her talent through silkscreening classes at The School of Visual Arts. She is not afraid to take on a slew of personal projects and is constantly motivated to learn and create, making her a perfect part of the Nights and Weekends Exhibition. What are you most inspired by and how do you seek out inspiration? What do you do when you are feeling stuck? I'm naturally a curious person so I'm inspired by learning new things, ordering unknown items off a menu, and even taking different routes home. Inspiration can be found anywhere so trying something new always helps me get out of a rut when I feel stuck. When do you feel like is the best time to create? I really like sketching when I'm on the subway, which I know is strange. If the train isn't packed like a sardine can, I'll draw even if it's for a 10-minute ride. I don't draw other passengers, though some think I do, but I jot down book ideas and make to-do lists. This has given me the additional skill of being able to stand on the subway without holding on to anything. What is your studio practice like? How often do you make? Are you working on multiple projects at once? Intermixing personal and professional? For the most part, my professional work is digital-based and done during the day while my personal work is all hand-made and saved for the night hours. This keeps a nice balance and I don't get bored of either. For personal projects, I do work on multiple projects at once, but they'll always be in different stages. When I'm screen printing a book, I'll probably be making preparations for the next book at the same time just so that I keep the productivity flow going. You are really great at initiating personal projects and books. Can you talk a little about artistic 'exercise' and building a variety of creative muscles? How do you decide to take on a new project? Around 2011, my day job started taking up more and more of my nights and weekends (haha!) so I wasn't able to draw as much and started feeling like my creativity plateaued. At the end of the year, I made a resolution to start keeping a sketchbook of ideas so I could remember and make them real one day. The most important thing I've learned about my artistic exercise is to date each entry so I'm honest to myself about keeping up my regiment. After 2 years of steady sketching, those books are now a reserve of ideas that I can cherry pick from when I need a new project. How I actually choose my projects is more of a gut feeling. Often times, if a project really makes me laugh or if it's just too weird not to exist, I have to make it. 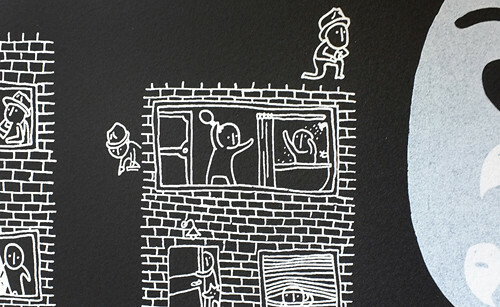 Your art is so cute and whimsical, and fits perfectly with the style of screen printing and books! Have you always been interested in this type of style, or did you find yourself simplifying it as part of your process? When I started to silkscreen, I'd been making personal comics with a more serious look. At the time, to be honest, I was still struggling to find my style so silkscreen helped me hit kind of a reset switch. As a silkscreen beginner, I was forced to simplify designs to get used to the medium and found myself switching to cuter, simpler drawings. Even when I became comfortable with the process, my new style really made me happy and felt truer to my personality, so I kept pushing in that direction. That's how I got to making what you see today. What is it that you love about printmaking? Do you think it has affected your process and how you work when sketching or finalizing ideas? Printmaking is an involving ordeal; it takes time to choose and gather a ton of materials and even more time to prep, print, cut, and assemble them but the quality of the final result has always been worth it. When I sell my books at conventions, I love when people pick them up and feel them because details like the paper and how the ink feels on it were all choices I made and they're part of the experience of "reading" them. So if you come across my book at Nights and Weekends, don't forget to pick it up! As you can tell, I totally drank the printmaking kool-aid. I sketch mostly book ideas now. Sometimes I sketch book forms independent of ideas. 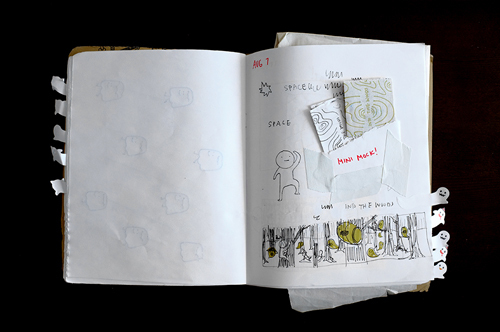 I even make pockets for mini book mockups in my sketchbook. Can you talk a little about the book project you have in the Nights and Weekends Exhibition? Where did the idea originate? What experience do you want people to have looking at your work? I knew I wanted to make a book about a neighborhood haunted by ghosts and the viewer to see it from many dimensions, from just a peek to really soaking in the scene. Books though, normally don't function like that and often feel flat, as in you only see the cover and everything else is hidden. 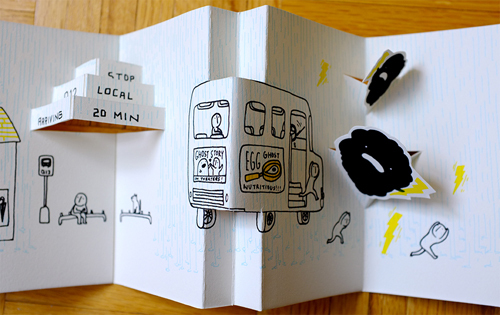 That's why I worked and worked to design the step accordion book form. Closed, you just see an inkling of what's going on, and completely open, you get the big picture of all the shenanigans. I've heard that you are on the hunt for the best type white out! It seems that the perfect materials are a very important part of your work and process. What are some materials you absolutely cannot work without? Yes! Finding good white out feels like an eternal search! If you have any suggestions, let me know. Ghosts seem to be a big icon in your work. Are there any other themes or objects that you love to depict? Not much has made as big a dent into my work as ghosts. A distant second would be food. If you look closely at my books, you can probably find people carrying roast chicken or drinking a cup of joe. In one of my newer books, Ghost Noir, I reenacted a scene from the movie Psycho but I felt bad, so I made the character hold a drumstick instead of a knife. What is your favorite project you have ever worked on? 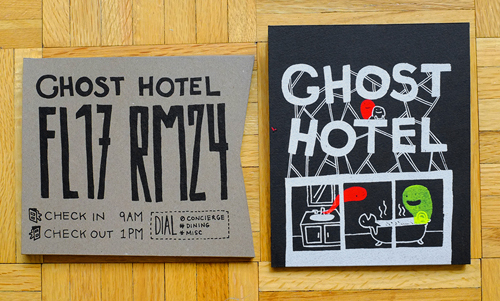 Currently, my favorite project is called Ghost Hotel. It's sentimental for me because it was my first time making a ghost book! Who are your art mentors, inspirational books, favorite resources? My favorite inspirational books are comics. Chris Ware's "Jimmy Corrigan, the Smartest Kid on Earth," Brecht Evan's "The Wrong Place," Michael DeForge's "Lose," David Mazzucchelli's "Asterios Polyp," and Jeff Lemire's "Essex County," are a few of my many favorites. What are some of your favorite hobbies outside of art-making? Reading comics, playing video games (The Last of Us, Katamari Damacy, Ico), and people watching (the stranger, the better). Are there any other projects that you are currently working on that you are excited about? We'd love to hear them! Thanks so much to Kim for taking the time to talk to us us about her work, her process, and her inspirations! You can find more of her work on her website or on her blog, as well as check out her piece for the exhibition on the Light Grey Art Lab shop or on the Nights and Weekends Exhibition page.